The cloud-connected Brewie claims to be the world’s first fully automated home brewery. In the future, at-home beer brewing will be a set-it-and-forget-it cinch, and not the convoluted mess we have always known it to be. That’s the feeling one gets from looking at Brewie, the latest in a series of countertop appliances designed to automate the process of beer crafting. The Brewie is said to distill the whole brewing process down to a series of simple steps requiring negligible human input, such that even the most hopeless of aspiring brewmasters can get started with it in no time at all. 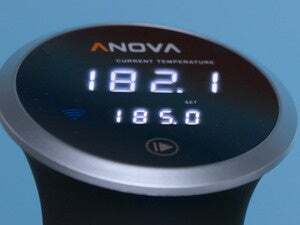 You can control the unit either through its 4.3-inch LCD touchscreen or via the companion app over Wi-Fi. It all starts with you selecting a beer recipe from the company’s database, after which you can either bring your own ingredients or order them from the company. 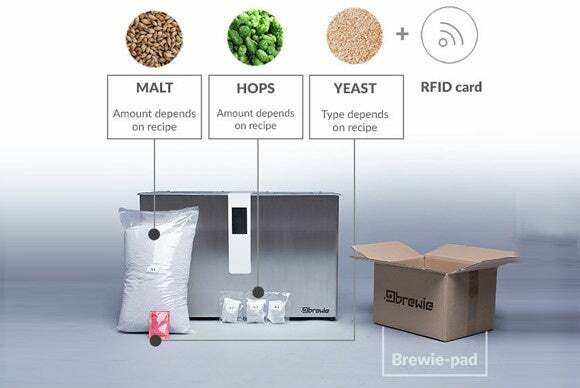 If you go with the second option, you’ll receive a so-called Brewie Pad: a package containing all the necessary ingredients—malt, hops and yeast—in carefully weighed quantities, plus an RFID card with the details of your recipe. Simply put the malt into the mashing tank and the hops into the four dedicated compartments, connect the unit to your home water supply, scan the recipe card using the machine’s built-in RFID scanner, and leave the Brewie to do its thing. Your brew should be ready for fermentation in 5 to 6 hours. “Brewie’s online recipe database is growing. We collaborate with professional breweries and home brewing experts to provide you a wide selection of quality beer recipes,” reads the product’s Indiegogo page. Users are free to create their own recipes, and can easily share them with other brewers from around the world using a company-provided social platform. The unit is likely to cost between $2,000 to $2,200 at retail, but the company is offering an “early bird” package—which includes a Brewie, one Brewie Pad and four 1.3-gallon kegs—for a discounted price of $1,700 until November 11. It’s expected to begin rolling out to the first set of backers in February 2016 (some six months behind schedule) and to InDemand pre-order customers a month after that. Why this matters: Many an aspiring homebrewer’s bubbling enthusiasm can fizzle when confronted with the forbidding realities of brewing. It’s an inexact science requiring exacting attention to detail; there’s a lot of trial and error, and the best brews are often the result of sheer happenstance. By lowering the entry bar, new-age home breweries like the Brewie could create a whole new class of brewing dilettantes. Who knows? For some, these machines could prove to be a stepping stone to the next level: the craft-brewing snob.